Artists: Glen Baldridge, Robert Buck, Benjamin Cohen, Nayda Collazo-Llorens, Ian Cooper, Jenelle Covino, Alex Dodge, Rachel Foullon, David Gatten, Dylan Gauthier, Graffiti Research Lab, Lynne Harlow, Adam Helms, Wennie Huang, Matthew Day Jackson, Heidi Neilson, Evan Roth, Jennifer Schmidt, Peter Simensky, Mary Temple, and Stephan von Muehlen. EFA Project Space presents Beyond A Memorable Fancy, an exhibition about print, perception, and artistic intervention.Focusing on the transformative aspects of printmaking, Beyond a Memorable Fancy explores the current trend of artists experimenting with print techniques in order to appropriate and manipulate information—be it from text or image sources, cultural symbols, or nature. 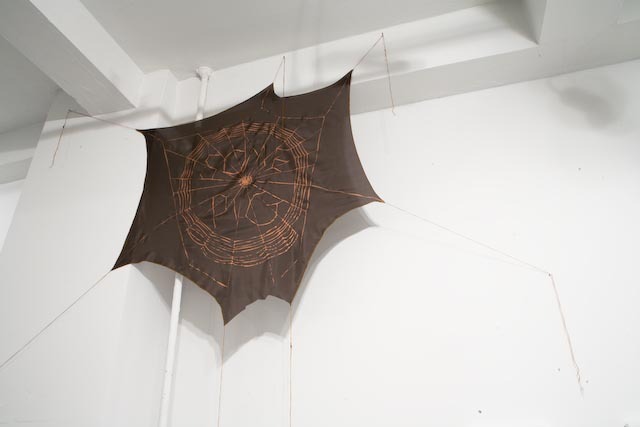 The art in the exhibition spans a range of unconventional formats, including experimental film, laser stencil graffiti, vinyl signage, cast shadows, and boat-making paraphernalia. Even the more common print techniques present are used to achieve an unexpected result.